Why Are My Pears Very Hard & Not Ripening? You may have heard that fruits are better when they ripen on the tree. However, while that is true for apples, it is not true for European and oriental varieties of pears. These pears are best harvested when they are slightly immature and hard to the touch. They then should be put in cold storage to trigger ethylene gas production, the process that causes pears to ripen. Most pears should naturally produce ethylene in sufficient quantities to trigger their own ripening. However, pears that are improperly harvested or not sufficiently exposed to cold temperatures may ultimately fail to soften and ripen. Pears are grown very similarly to apples. European, oriental hybrid and Asian pears are three main types of pears. Unlike other pear types, Asian pears will remain hard even when ripe. They are ready to eat off the tree and are best picked at their peak ripeness. They are not easily confused with common European pears because of their round shape and crisp texture. European pears are smooth, "pear-shaped" and readily available. Oriental hybrids are very adaptable, but they are not as prevalent because of their grittier, less desirable texture. Store-bought pears typically require time at room temperature to soften and become ripe. Maintain pears for a few days, ideally between 65 and 75 degrees Fahrenheit. This should trigger production of the ripening hormone ethylene. Cold storage will delay ripening; fruit will remain hard as long as it is refrigerated. Induce or shorten ripening time by placing pears in a paper bag with another ripe, ethylene-producing fruit, such as an apple or banana. The presence of other fruit will initiate ethylene production in the pear, and the paper bag will contain the gas, accelerating the ripening process. Good-tasting pears require proper harvesting. In general, pears that are picked when they are slightly immature will ripen better than pears picked when they are over-mature. If left on the tree too long, the core of the pear will become mushy, causing the pear to taste gritty. On the other hand, if pears are picked too early they may rot without ever becoming soft. 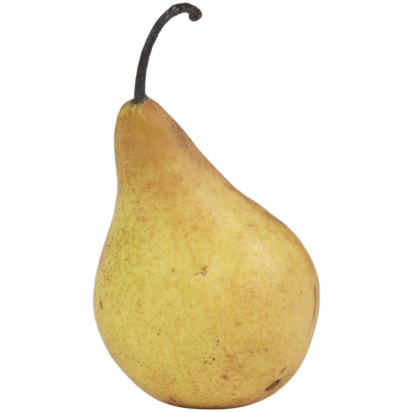 Home growers need to know what signs to look for to determine whether pears are harvest-ready. For starters, pears should be full-size. They will also easily detach when lifted from a vertical hanging position to a horizontal position. Fruit on the top of larger trees tends to ripen first in the season. In addition, the skin of the pear will feel relatively smooth and waxy rather than rough and textured. European and oriental hybrid pear varieties require a period of cold storage after harvest to properly mature. Without this chilling, mature pears are likely to remain hard and spoil, without ever ripening. This chilling time requirement varies by cultivar. Generally, pears with late harvest dates require less cooling time. Cold temperatures stimulate pears to produce the ethylene gas. This should not be a problem with store-bought pears, because fruit is sold commercially following post-harvest chilling. Christine McLachlan has been writing professionally since 2010. Before starting an e-commerce business, she worked as an urban planner/landscape designer for five years. Mrs. McLachlan has a Bachelor of Science in English and political science, as well as a Master of Science in urban planning, from Florida State University. In addition, she holds a Master of Landscape Architecture from the University of Florida.